Synopsis: Twelve-year-old Caleb is shorter, frailer, and more protected than most kids his age. That's because he has cystic fibrosis, a diagnosis meaning lungs that fill with mucus and a shortened lifespan. 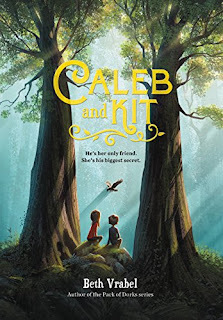 Caleb tries not to let his disorder define him, but it can be hard with an overprotective mom and a perfect big brother. Then Caleb meets Kit-a vibrant, independent, and free girl-and his world changes instantly. Kit reads Caleb's palm and tells him they are destined to become friends. She calls birds down from the sky and turns every day into an adventure. Her magic is contagious, making Caleb question the rules and order in his life. But being Kit's friend means embracing deception and danger, and soon Caleb will have to decide if his friendship with Kit is really what's best for him-or her. Review: A beautiful, heart-wrenching, hope inducing tale. Do you believe in fairies? I do. I believe people come into our life for a reason, and like Kit, I think she and Caleb were destined to meet. They help each other in ways they didn't know they needed, and without realizing it. But is Kit's imagination enough to carry them through? About the Author: Beth Vrabel is the award-winning author of 'A Blind Guide to Stinkville', 'A Blind Guide to Normal', and the 'Pack of Dorks' series. She can't clap to the beat or be trusted around Nutella, but she indulges in both often, much to the dismay of her family. She lives in Canton, Connecticut.